Neopor is a new generation EPS which contains graphite to improve the thermal insulation properties of the material. The improved thermal insulation properties of the material mean that thinner sheets can be used to provide equivalent thermal insulation to standard ‘white EPS’ providing a more cost effective insulation solution. Neopor has been used extensively in Europe and the US to retrofit existing buildings to make them compliant with energy saving regulations as well as thermally insulate buildings that were built before the advent of modern day insulation materials. In the majority of cases Neopor panels are applied to the outside of existing walls or on top of roofs or in the roof space. 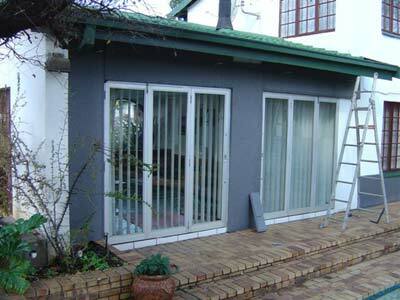 Neopor Retrofit has been introduced to South Africa primarily as an sheet cladding which is stuck to the outside of brick, plastered and painted walls to thermally insulate buildings which suffer excessive heat or cold and are thus uncomfortable to live in or consume undue amounts of energy to maintain building comfort. The Neopor Retrofit system incorporates Neopor sheets cut to size to fit the building wall area, an EPS adhesive to glue the sheets to the sub structure and an EPS plaster system to provide impact resistance and decorative effect to the outer wall surface. The system is completed by painting the walls.